We're thoroughly enjoying all of the new pets in the latest content patch. Here are a few additional 6.1 notes that you may have missed. There are two new trainers in Patch 6.1, Erris the Collector (A) and Kura Thunderhoof (H). They will only periodically show up in your garrison, but don't let their tendency to travel discourage you from completing their quest each day. If your garrison goes a day or two without a visit from these NPCs, the in-game Looking For Group tool is a great place to find them. By using the Group Finder window and selecting Premade Groups, you can choose a Custom group and search for either traveling trainer (pictured above). 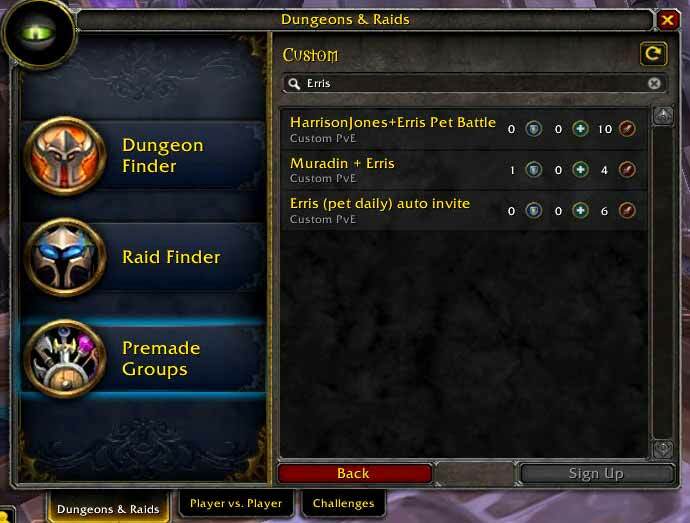 We also have a forum thread dedicated to those willing to share an invite for the daily, just in case the Group Finder tool doesn't return any results. But it has to be said that the in-game method is much more convenient! It's been observed that these two NPCs exhibit some interesting behavior when it comes from traveling from garrison to garrison. If you pick up and complete their daily from someone else's garrison, Erris and Kura will remain in your garrison (and your alts' garrisons) for the rest of the day. Best Erris or Kura in a Pet Battle and earn a visit! Even if you can't duel them a second time in the same day, you can always share the daily with a friend. Power-leveling pets through the Menagerie was essentially removed in 6.1, since experience from Menagerie Pet Battles was drastically reduced. However, there is still one encounter to look forward to if you're looking to level pets while in your garrison; Squirt's team of Deebs, Tyri, Puzzle. This particular Menagerie battle has not been nerfed and grants pet experience equivalent to that of a Cataclysm or WotLK trainer. We don't know why the Squirt battle remains unchanged in terms of experience, or whether or not this is merely an oversight on Blizzard's part. Needless to say, it might be worth spending some extra time battling Squirt's team when she visits! According to the schedule, new racing features, achievements and rewards will unlock each month. 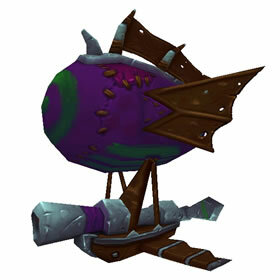 The Race MiniZep (pictured right) will not be available until April's Darkmoon Faire. Brush up and practice your racing skills; a new pet will be zooming into collections next month. Don't get left in the dust! I think the obvious reason that Squirt's team gives out significant XP still is that it's the only one of the menagerie dailies where you're actually facing a trainer. All the other battles are just you fighting the pets themselves. I joined a group today and went to the garrison but Erris' quest would not show for me. What was I doing incorrectly? I have a level 3 PM at my garrison so that can't be the problem. Quint, I just noticed a small error in the news. You don't have to actually win against Erris to get her, if you track her down in LFG. All you have to do is pick up her quest. Then she will be in all your account's garrisons, and you can complete the quest at your leisure on the toon of your choice. XP might have been nerfed in the garrison daily battle, but it's one feature altoholics have a big advantage in, especially since the tokens are BoA now. I open a week's worth of bags at a time, send everything to my main, and combine it all into one long level-fest. Another interesting fact about Erris and her horde counterpart: she will appear in your Garrison as soon as you pick up the quest! So just picking it up in someone else's Garrison and completing it later works too if you're in a hurry. You might mention that Erris/Kura have a really high pet experience modifier. Although you can only battle them once per day, it is the highest/second highest (depending on the level of the carry pet) pet experience modifier in the game and usually a pretty easy fight to two pet.